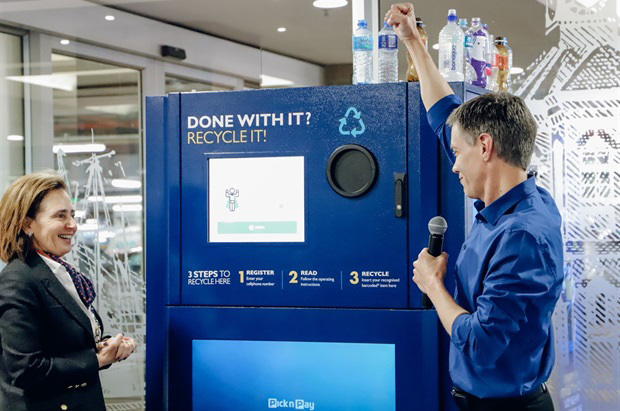 The Pick n Pay store at the V&A Waterfront in Cape Town has introduced a recycling vending machine. Customers are now able to dispose of their recyclables into the machine, provided it has a barcode that can identify the product. Non-barcoded recyclables will have to be placed in the waste bins provided next to the machines. The recycling vending machines are still in a trial period that will run until the end of February 2019. The machines will accept recyclable waste such as plastics, cans, coffee cups, juice cartons, glass bottles and more. To use the machines, people can simply follow the instructions on the vending machine. Scan the barcode of the product and insert the recyclable into the slot. The machine will return any item that does not have a recognisable barcode or that is not recyclable. The returned items can be placed in the adjacent waste bin. The accepted recyclables will be stored in the machine and information about the waste will be sent to Imagined Earth – a green advertising initiative that harnesses the power of technology to create an interactive recycling experience. Each machine is able to store between 650 and 750 waste items, or about 375 two-litre milk bottles. The machines monitor their capacity and automatically notify the waste management provider when they need to be emptied. The recyclable waste is then manually sorted off-site and the various materials are sent to the correct recycling facilities. Consumers will be allowed to use the machines once per day. Those that use the machines more than three times per month will be entered into a draw to win one of fifty Pick n Pay reusable RPET bags at the end of that month. Recyclers who use the machines six times or more will be entered into the final draw to win R5000 at the end of the trial period in February 2019. When using the recycling vending machine, consumers will be asked to enter their cell phone numbers. These contact details will also be entered into a smaller draw throughout the month to win a R200 Pick n Pay voucher. Winners will be notified via SMS and this needs to be shown to the Pick n Pay store manager to redeem the prize.